“As we learn more, reality becomes ever more subtle; the absolute becomes relative, the fixed becomes dynamical, the definite is laden with uncertainty,” writes physicist Yasha Neiman. 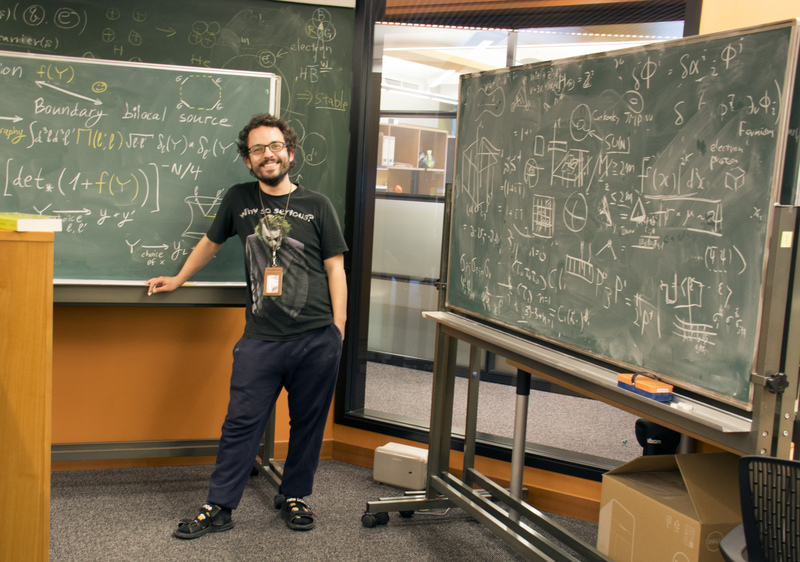 A professor and head of the Quantum Gravity Unit at the Okinawa Institute of Science and Technology Graduate University (OIST), he grapples with this conundrum on a daily basis. Quantum gravity, Neiman’s branch of physics, aims to unify quantum mechanics, which describes nature at the scale of atoms and subatomic particles, with Einstein’s theory of General Relativity—the modern theory of gravitation as curvature of space and time. How, he asks, can physicists write equations when the geometry of space itself becomes subject to quantum uncertainty? Quantum gravity, the current frontier in fundamental theory, has proven more difficult to detangle than previous concepts, according to Neiman. Holography is an offshoot of string theory—the theory that the Universe is made up of one-dimensional objects called strings—which was developed in the late 1990s. Holography imagines the ends of the Universe as the surface of an infinitely large sphere that forms the boundary of space. Even as geometry fluctuates within this sphere, this “boundary at infinity” on the sphere’s surface can remain fixed. “The accelerating expansion of our Universe and the finite speed of light conspire to limit all possible observations, present or future, to a finite—though very large—region of space,” Neiman writes. In the 1960s, in an attempt to understand quantum gravity, physicist Roger Penrose proposed such a radical alternative. In Penrose’s twistor theory, geometric points are replaced by twistors—entities that most closely resemble stretched, light ray-like shapes. Within this twistor space, Penrose discovered a highly efficient way to represent fields that travel at the speed of light, such as electromagnetic and gravitational fields. Reality, however, is composed of more than fields—one needs also to account for the interactions between them, such as the electric force between charges, or, in the more complicated case of General Relativity, gravitational attraction resulting from the energy of the field itself. However, including the interactions of General Relativity into this picture has proven a formidable task. Penrose, R., & Rindler, W. (1986). Spinors and Space-Time (Cambridge Monographs on Mathematical Physics). Cambridge: Cambridge University Press. Neiman’s model builds on higher spin gravity, a model developed by Mikhail Vasiliev in the 1980s and 90s. Higher spin gravity can be thought of as the “smaller cousin” of String Theory, “too simple to reproduce General Relativity, but very instructive as a playground for ideas,” as Neiman puts it. In particular, it is perfectly suited for exploring possible bridges between holography and twistor theory. 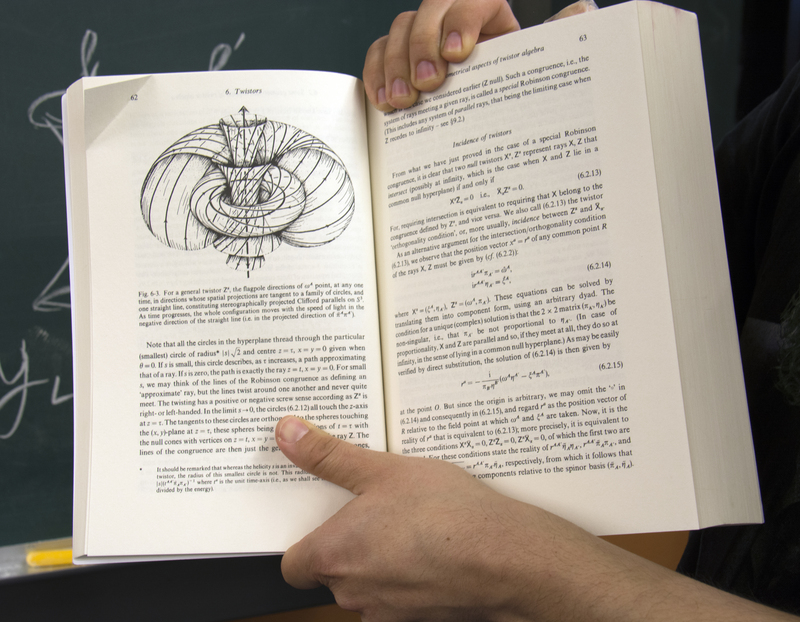 From these starting points, Neiman’s paper takes an additional step, constructing a mathematical dictionary that ties together the languages of holography and twistor theory. Using square roots in this way has a long-standing history in math and physics. In fact, the intrinsic shape of all matter particles—such as electrons and quarks—as well as twistors, is described by a square root of ordinary directions in space. In a subtle technical sense, Neiman’s method for connecting space, its boundary at infinity, and twistor space, boils down to taking such a square root again.